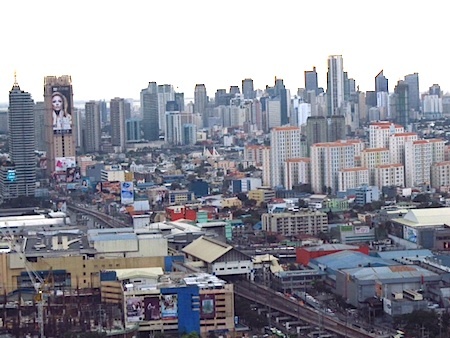 MANILA — The sun rose here to another towering and impressive Asian skyline. On the 10th anniversary of 9/11, while the world joins the United States in honoring a terrifying moment, I see skylines here and in China that describe in clear line and form just how far that day blasted us off course. One measure is the scant alterations in the skylines of big American cities in the last decade. Another is that in Washington and most state capitals the stupid party has no clue how to stop the evil party from damaging the economy and America’s capacity to reckon with big problems. We’ve become a nation of ‘no’ — no progress, no money, no change, no chance. Meanwhile, the growing nations of Asia are all about ‘yes.’ In Shanghai, new subway lines measuring 35 kilometers and more, take four years to construct. It takes that long to consider permits for big projects in the U.S. Yesterday I boarded a maglev train from downtown Shanghai to Pudong Airport, a $6.50 ride at 431 kilometers per hour (267 mph) that took less than 10 minutes. A cab takes 50 minutes and costs $30. In the U.S., the evil party views trains the same way they view gay marriage, as an ideological affront. Two of our conservative governors in the Midwest earlier this year returned to the federal government hundreds of millions of dollars to improve the regional passenger rail network. Manila is no Shanghai, now very clearly competing with Tokyo and Hong Kong for the honor of being viewed as the capital of Asia. For that matter, Shanghai at this point is competing with New York to claim distinction as capital of the world. Manila has its own aspirations. Demographers report that 20 million people now live in the largest metropolitan region in the Philippines. That’s more people than live in all but two American states — California and Texas. Traffic is intense 24/7. A lot of the office towers seen from my room on the 26th floor of the Malayan Plaza hotel look new. The air today is cleaner than what I breathe in Beijing and Shanghai. Donald Trump, the newspaper reported this morning, just reached agreement with a big Manila developer to put his name on a new mixed-use luxury tower. There’s more. Use the door latch and check all visitors to the room. And watch out for “various con artists and tricksters” seeking “loans” that quite obviously won’t be repaid. It’s a useful recounting of safety suggestions, a kind of informal Manila street-level operating system designed for new arrivals. I wonder if we can’t write something similar for dealing with the con artists and tricksters who’ve driven America to post 9/11 stagnation and frustration. Advisory number one: Get real, people! Gay marriage. Abortion. Guns. Lower taxes. Deficit reduction. Hate radio. That’s like cleaning up a sewage spill with a soup spoon.